Patients with cognitive impairment can experience poorer outcomes after surgery if they do not receive care tailored to their needs when waking up in the recovery room. Hospital environments are poorly suited to people with dementia because they are noisy, busy and brightly lit, and patients meet many different members of staff. Patients in the recovery room are emerging from sedation or general anaesthetic and may also have nerve blocks reducing the use of limbs. Waking up in a different room from where they went to sleep adds to the confusion, disorientation and anxiety, leading to difficult and sometimes aggressive behaviour. 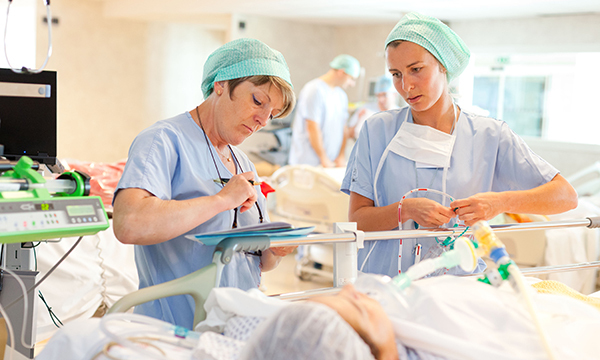 If patients do not receive effective care on waking from their anaesthetic they risk developing complications such as hypoxia from not tolerating the oxygen mask. To avoid these risks, patients are sometimes chemically restrained using intravenous drugs such as midazolam. In this trial at Nottingham University Hospitals, a dementia care resource trolley was developed. The trolley, used at the patient’s bedside, houses a CD player with disposable headphones and a selection of classical CDs, a twiddle muff (a knitted muff with accessories sewn on as an activity for restless hands) and stress-relieving toys. The researchers also provided education for all staff including porters who escorted patients to theatre. A further arm of the project was to provide carers of dementia patients with passports that facilitate their involvement in care and allow them unrestricted access to patients. These carers are then able to be present in anaesthetic and recovery rooms. Edis H (2017) Improving care for patients with dementia in the recovery room. British Journal of Nursing. 26, 20, 1102-1108.